EVA Air is adding its popular Hello Kitty Hand-in-Hand Jet into its Los Angeles schedule on a regular basis on Tuesday (March 27, 2018). It is using the specially painted plane on Tuesdays, Thursdays and Saturdays for three of the 21 nonstop flights it operates between Los Angeles and Taipei, Taiwan every week. From nose to tail of the colorful Boeing 777-300ER, Hello Kitty and Sanrio friends of different colors, shapes and sizes join hands and invite fun and friendship. Among the 19 Sanrio Family characters linking hands with Hello Kitty and Dear Daniel are My Melody, Kuromi, Little Twin Stars, Cinnamoroll, Pompom Purin and Bad Badtz-Maru. EVA BR005 departs Los Angeles International Airport (LAX) at 11:55 am and gets into Taoyuan International Airport (TPE) at 5:05 pm the next day. Return flight BR006 leaves TPE at 10:10 am and arrives in LAX at 6:50 am. The specially painted Boeing 777-300ER is configured in three cabins, Royal Laurel Class business, Premium Economy and Economy. Flight time from LAX to TPE is 14 hrs. and 10 mins. From TPE to LAX, it’s 11 hrs. and 40 mins. The fun of flying on EVA’s Hello Kitty and Sanrio Family Jets begins at airport check-in with special boarding passes and baggage stickers. Onboard, cabin crews wear Hello Kitty Jet aprons and passengers use themed service items, including headrest covers, pillows, tissue, hand cream, soap, napkins, paper cups, utensils and snacks. EVA flies seven of the specially painted planes on routes within Asia, in addition to long-haul service to Chicago and Los Angeles. Its other Hello Kitty planes are the Shining Star, Joyful Dream, Celebration Flight and Friendship Bows. Its Sanrio Family aircraft are the gudetama Comfort Flight and Bad Badtz-Maru Travel Fun planes. Top Copyright Photo (all others by EVA Air): EVA Air Boeing 777-35E ER B-16703 (msn 32643) (Hello Kitty – Sanrio Family) LAX (Michael B. Ing). Image: 920984. This entry was posted in EVA Air and tagged B-16703, Boeing 777-35E ER, EVA Air, Hello Kitty - Sanrio Family, LAX, msn 32643 on March 27, 2018 by Bruce Drum. Juneyao Airlines, the first “Connecting Partner” of Star Alliance, has started a codeshare partnership with EVA Air on routes across the Taiwan Straits from March 26, 2018. The codeshare cooperation will bring more travelling choices for passengers flying across the Taiwan strait, and will have apositive impact on the expansion of Juneyao’s network in Asia, warming up the relationship between the Chinese mainland and Taiwan. According to the codeshare agreement, Juneyao Airlines and EVA Air will place their own codes on flights operated by partners connecting Shanghai Pudong – Taipei Taoyuan and Shanghai Pudong – Kaohsiung. Meanwhile, Juneyao Airlines will continue its FFP offerings on connecting flights providing priority check-in, priority baggage handling, priority boarding, extra baggage allowance, and lounge access for Star Alliance Elite members, including those from EVA Air. Juneyao Airlines Co., Ltd is a wholly owned subsidiary of Juneyao Group, targeting at middle-to-high-level official, business and private tourism markets. Juneyao Airlines started its inaugural flight in September 2006 and became the first Connecting Partner of Star Alliance in May 2017. As of today, Juneyao Airlines owns 68 brand new Airbus A320 series aircrafts whose average age is only 3 years. In 2017, Juneyao Airlines have carried over 16 million passengers. Based in Shanghai and Nanjing, Juneyao Airlines operates 110 routes linking major cities in China as well as surrounding countries. It will further launch intercontinental flights after receiving Boeing 787-9 Dreamliners in late 2018. 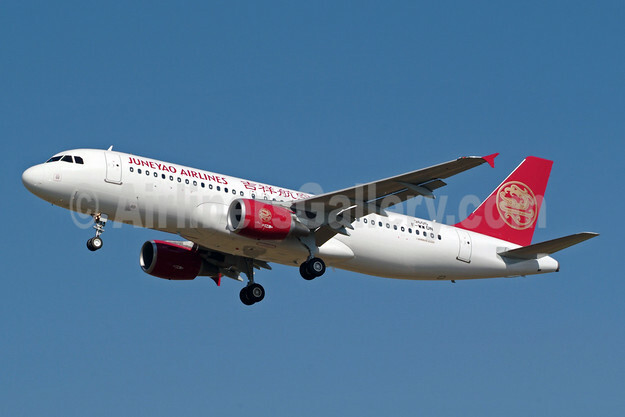 Copyright Photo: Juneyao Airlines Airbus A320-214 F-WWDN (B-6396) (msn 3605) TLS (Karl Cornil). Image: 905966. This entry was posted in EVA Air, Juneyao Airlines and tagged Airbus A320-214, B-6396, EVA Air, F-WWDN, Juneyao Airlines, msn 3605 on March 27, 2018 by Bruce Drum. EVA Air took delivery of its first Boeing 777 freighter, registration B-16781, at the Boeing Everett Delivery Center in Seattle on Wednesday, November 8, 2017. The carrier flew its newest freighter from Paine Field to Taiwan’s Taoyuan International Airport (TPE), departing shortly after delivery and arriving on Thursday, November 9, 2017 (Taipei Time). The airport welcomed Taiwan’s first Boeing 777 freighter with a water cannon ceremony provided with two fire trucks. EVA plans to put its new Boeing 777 freighter in service on routes between Asia and North America in late November. The airline’s freighter destinations in Asia include Shanghai Pudong, Shenzhen, Chongqing, Hong Kong, Osaka, Singapore, Bangkok, Penang and Hanoi. Its air cargo gateways in North America are Los Angeles, San Francisco, Chicago, Dallas/Fort Worth and Atlanta. EVA now provides airfreight services on 62 routes, including five dedicated cargo gateways, with 35 weekly freighter flights. Shippers and freight forwarders can reserve space at http://www.brcargo.com and track shipments from their smart phones with the EVA Cargo App. The highly efficient Boeing 777 freighter is the world’s largest twin-engine air cargo carrier. The Boeing Company designed it to replace both the 747-400 and MD11 freighters. Based on the Boeing 777-200LR, the 777 freighter has the range to fly 5,000 nautical miles fully loaded with a maximum capacity of 102 tons. EVA can use it to fly airfreight from Taiwan to any destination in North America with one technical stop in Anchorage, Alaska. Energy-efficient and environment-friendly, Boeing 777 freighter is expected to effectively reduce carbon emissions compared to the 747-400 freighter. EVA is equipping its Boeing 777 freighters with GE90-115B Turbofan Engines, the same as those used to power its 34 Boeing 777-300ER passenger planes. By using the same engine, EVA will not only reduce maintenance costs but also promote maintenance management efficiencies for its turbofan engines. Both the 777 and 747-400 freighters accommodate the same-sized pallets and containers, providing the advantages of resource sharing and smoothing the cargo-loading process during EVA’s transition to the newer aircraft. The addition of 777F to the fleet also gives flight crews the flexibility to fly both passenger and cargo models after they have completed EVA’s demanding pilot-training program. EVA ordered five 777 freighters from the Boeing Company in July 2015 and will take delivery of the additional four by September 2019. As it adds the new freighters, it will successively retire its five remaining 747-400 freighters by the end of 2019. EVA is now operating a fleet of 79 aircraft, including the new freighter. This entry was posted in EVA Air and tagged 777F, B-16781, Boeing 777F, EVA Air on November 13, 2017 by Bruce Drum. 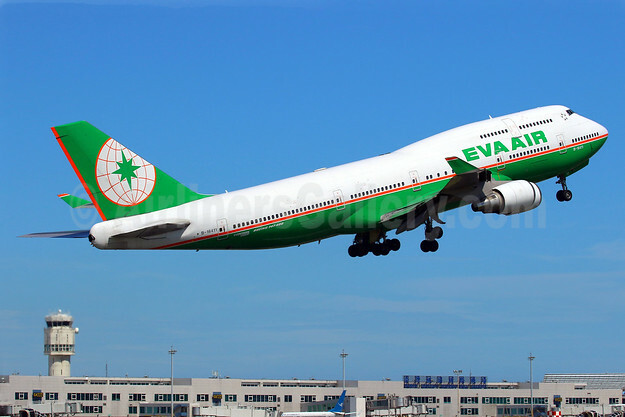 EVA Air (Taipei) has confirmed it will operate its last Boeing 747-400 revenue passenger flight this month (the carrier will continue to operate all-cargo freighter flights with the type). Subject to any last minute changes, the last flight is scheduled to be flight BR 892 on August 21, 2017 between Hong Kong (HKG) and Taipei (Taoyuan) (TPE). The Jumbo flight is scheduled to arrive at 1130 (11:30 am) local time. The carrier’s first two all-passenger Boeing 747-400s were delivered in November 1992. EVA Air utilized the new aircraft to launch its Taipei-Los Angeles route and introduce its four classes of cabin service, including the debut of its Evergreen Deluxe Class in Economy and Super Business. The last Boeing 747-400 is the pictured B-16411 which will operate the last flight. Copyright Photo: EVA Air Boeing 747-45E B-16411 (msn 29111) TPE (Manuel Negrerie). Image: 938933. This entry was posted in EVA Air and tagged B-16411, Boeing 747-45E, EVA Air, Last Boeing 747 Flight, msn 29111, TPE on August 7, 2017 by Bruce Drum. 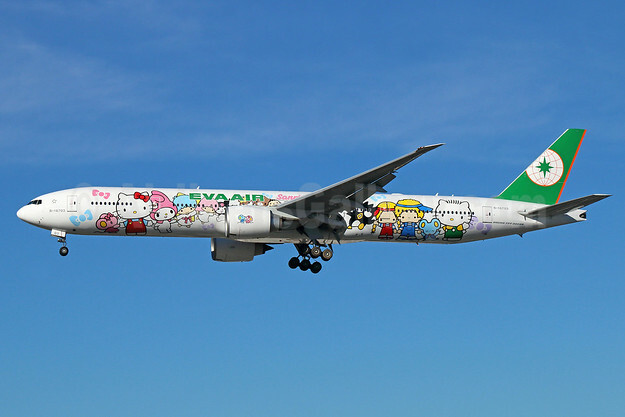 EVA Air is introducing more characters and creating a new edition of its popular Sanrio-family aircraft. Best known for Hello Kitty jets, EVA launched a “Travel Fun” Jet on Saturday, March 4, 2017, starring the naughtily charming Sanrio character, Bad Badtz-Maru. The airline is flying the latest in its collection of specially painted planes on Taipei-Fukuoka and Taipei-Seoul routes. 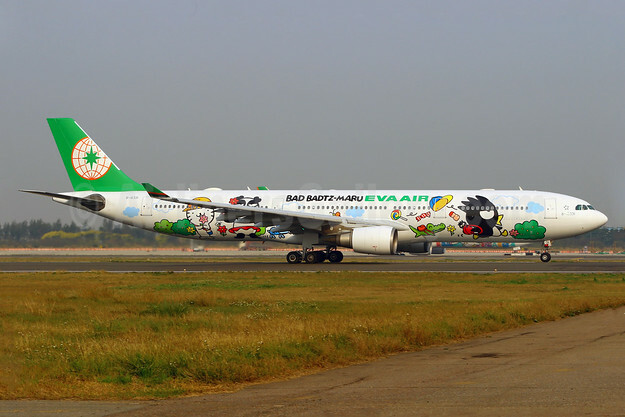 The aircraft is the world’s first with Bad Badtz-Maru livery to be scheduled for international service. EVA’s Badtz-Maru Travel Fun Jet is an Airbus A330-300 configured for 309 passengers, 30 in Business Class and 279 in Economy. To start, flight BR106 departs Taipei’s Taoyuan International Airport at 8:10 (8:10 am) and arrives at Fukuoka Airport at 11:15 (11:15 am). Return flight BR105 leaves Fukuoka at 12:15 (12:15 pm) and gets back to Taipei at 13:50 (1:50 pm). EVA then operates the aircraft as BR160, taking off from Taoyuan International Airport at 15:15 (3:15 pm) and arriving at Seoul’s Incheon Airport at 18:45 (6:45 pm). Return flight BR159 leaves Incheon at 19:45 (7:45 pm) and arrives back in Taipei at 21:40 (9:40 pm). Bad Badtz-Maru is one of the Sanrio family’s most popular characters. Different from Hello Kitty’s sweet image, Badtz-Maru is naughty in a charming kind of way. The new livery captures Bad Badtz-Maru in action, wearing his backpack and sprinting to the nose of the plane, ahead of his best friends. With hats, a camera, snacks and other holiday necessities, Bad Badtz-Maru and friends are ready for a relaxing, laughter-filled vacation aboard EVA. Building on affiliate UNI Air’s domestic success with its launch of the world’s first Bad Badtz-Maru aircraft last year and complementing its new Sanrio-family livery, EVA has designed more than 30 inflight service items and cabin amenities, including Bad Badtz-Maru pillows, slippers, headrest covers, playing cards, meal boxes, post cards, safety cards and disposable hand towels. All items are part of the airline’s dedicated program to make the flying experience fun for passengers. EVA and its Sanrio family jets have been popular among passengers all over the world since it launched its first generation of Hello Kitty Jets in 2005. In 2016, the Daily Mail recognized EVA’s specially painted aircraft among the world’s best liveries and Global Traveler Magazine awarded the carrier a special “Leisure Lifestyle Award for Outstanding Customized Service,” recognizing it for “going beyond what is expected” and “doing something extraordinary.” To keep giving passengers fresh experiences and making flying fun, EVA is renewing its series of specially themed aircraft and developing new liveries during the first half of this year. Top Copyright Photo: EVA Air Airbus A330-302 B-16331 (msn 1254) (Bad Badtz-Maru) TPE (Manuel Negrerie). Image: 937197. This entry was posted in EVA Air and tagged Airbus A330-302, B-16331, Bad Badtz-Maru, EVA Air, msn 1254, TPE on March 7, 2017 by Bruce Drum. SKYTRAX, an international air transport standards and quality rating organization, awarded EVA Air its prestigious 5-Star Airline ranking during a ceremony in Taipei, Taiwan on June 15, 2016. The 5-Star ranking is SKYTRAX’s highest global airline quality rating and the result of direct and professional analysis of as many as 800 different areas of EVA’s product and service delivery. SKYTRAX initiated a thorough evaluation of EVA in May 2015. The airline rating organization sent auditors to fly the airline and analyze airport and onboard products in addition to frontline staff service on the ground and in the air. These auditors flew multiple EVA flights from different gateways and sampled all of the carrier’s cabin classes during the year-long process of certifying the 5-Star Airline Rating. SKYTRAX ranks airlines in five categories, from 1-star through the top 5-star designation. Its evaluations are recognized as a global benchmark for airline quality. SKYTRAX also ranked EVA as one of the “World’s Top-10 Best Airlines” and the number one airline for “Best Airline Cabin Cleanliness” for 2015, based on its annual quality satisfaction survey of travelers worldwide. EVA joins an elite group of carriers consistently recognized as the best of the best. The other seven 5-star airlines are All Nippon Airways, Asiana Airlines, Cathay Pacific Airways, Garuda Indonesia, Hainan Airlines, Qatar Airways and Singapore Airlines. Copyright Photo: EVA Air Boeing 777-35E ER B-16726 (msn 44552) LAX (Michael B. Ing). Image: 931610. This entry was posted in EVA Air and tagged B-16726, Boeing 777-35E ER, EVA Air, LAX, msn 44552 on June 16, 2016 by Bruce Drum.